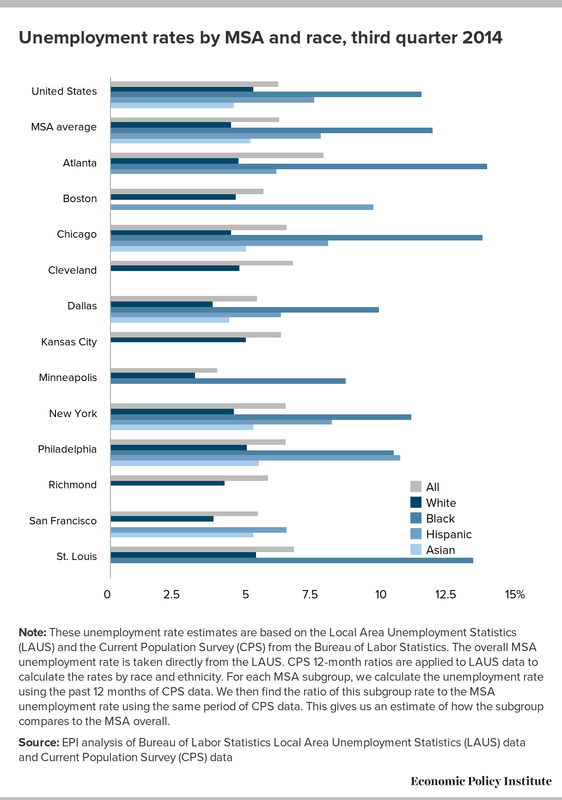 This fact sheet provides estimates of unemployment rates for the third quarter of 2014 by race and ethnicity in each of the 12 metropolitan statistical areas (MSAs) with a Federal Reserve Bank. One of the most important determinants of how low unemployment rates get will be when the Federal Reserve decides to begin raising short-term interest rates. This is especially important for African Americans, who typically have an unemployment rate nearly twice the overall unemployment rate and at least double that of whites. If the Fed were to prematurely tighten interest rates and stop providing a boost to recovery when the overall unemployment rate still had an excess 1 or 2 percentage points that it could fall before sparking an uptick in inflation, this means excess black unemployment would be 2 to 4 percentage points. 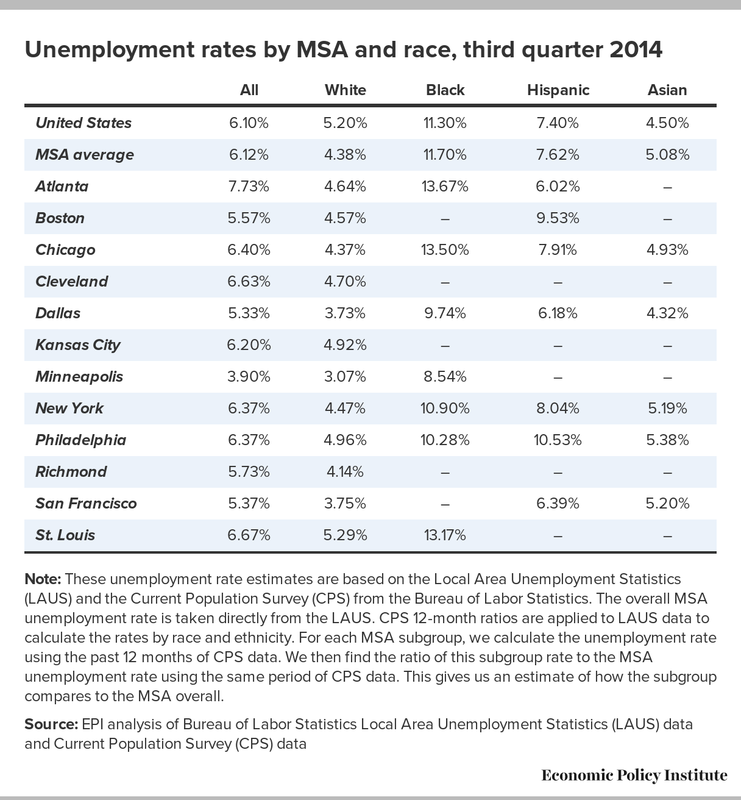 The estimates in Table 1 are calculated on a quarterly basis in order to generate a sample size large enough to create current, yet reliable, estimates of unemployment rates by race and ethnicity at the MSA level. We only report estimates for MSAs where the sample size of these subgroups is large enough to create an accurate estimate. Note: These unemployment rate estimates are based on the Local Area Unemployment Statistics (LAUS) and the Current Population Survey (CPS) from the Bureau of Labor Statistics. The overall MSA unemployment rate is taken directly from the LAUS. CPS 12-month ratios are applied to LAUS data to calculate the rates by race and ethnicity. For each MSA subgroup, we calculate the unemployment rate using the past 12 months of CPS data. We then find the ratio of this subgroup rate to the MSA unemployment rate using the same period of CPS data. This gives us an estimate of how the subgroup compares to the MSA overall. It is important to remember that the unemployment rate is just one way of assessing the health of local labor markets. For example, because only people who are actively looking for work are counted as unemployed, the unemployment rate could underestimate the full extent of labor market slack in an economy that is still below full employment if many potential workers have stopped actively looking for work but would resume looking if job opportunities became more plentiful. National unemployment rates (overall and by race and ethnicity) closely reflect the average across these major metro areas. This sample of Federal Reserve Bank MSAs provides a reasonable cross-section of metro labor market conditions across the country. In more racially diverse metro areas, effectively lowering unemployment for people of color is essential to lowering the unemployment rate of the metro area and strengthening the local economy. For example, roughly one-third of Atlanta’s population is African American. With a black unemployment rate of 13.7 percent (the highest among available Fed MSAs), Atlanta has the highest overall unemployment rate (7.7 percent) even though the white and Hispanic rates are below each group’s national average. Nationally, the black unemployment rate was 6.1 percentage points higher than the white unemployment rate during the third quarter of 2014. Of the seven MSAs for which estimates of the black unemployment rate are available, the largest black-white disparity was in Chicago (9.1 percentage points) and the smallest was in Philadelphia (5.3 percentage points). Nationally, the Hispanic unemployment rate was 2.2 percentage points higher than the white unemployment rate during the third quarter of 2014. Of the seven MSAs for which we were able to estimate the Hispanic unemployment rate, the largest Hispanic-white disparity was in Philadelphia (5.6 percentage points) and the smallest was in Atlanta (1.4 percentage points).